The City of Houston Water Department has cancelled the boil water notice issued on Sunday, March 4, 2018. 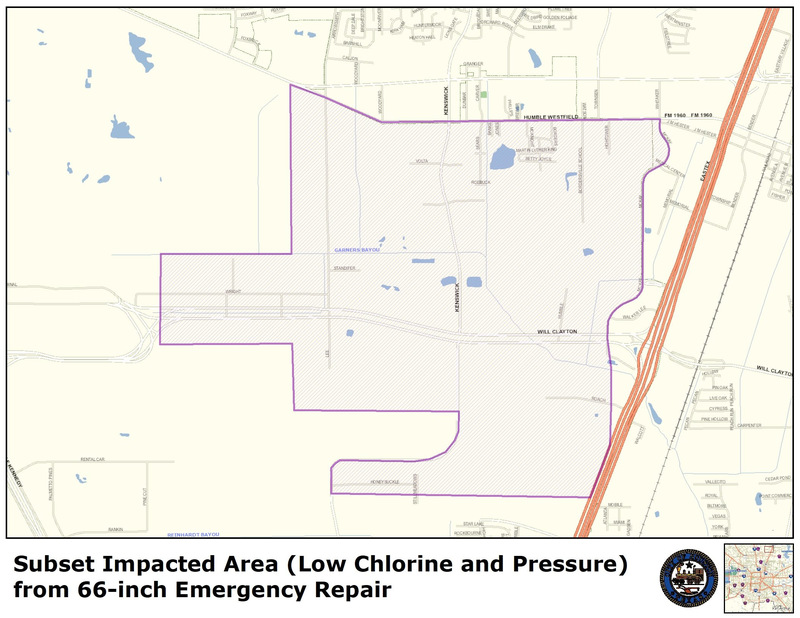 It affected residents north of Will Clayton Parkway, east of the airport, west of US 59 and south of FM 1960 after repairs were made on a 66-inch (5.5-foot diameter) water main located near Beltway 8 North and US 59. Final water test samples confirmed NO contamination and the water meets all State drinking water standards. Posted March 6, 2018 –The Drinking Water Advisory for affected area is still in effect. The City of Houston has completed repairs on a 66-inch (5.5-foot diameter) water main located near Beltway 8 North and US 59. Although the city is not aware of any problems with the water supply to the area, a boil drinking water advisory is in effect as a precaution for people in the area of Will Clayton Parkway, east of the airport and west of US 59 until final water test results meet state drinking water standards. Houston Public Works is monitoring the situation and will have final water test results from the laboratory in the next 24-48 hours. Due to low water pressure and low chlorine in the system, the Texas Commission on Environmental Quality requires the Houston Main Water System (TX1010013) notify all affected customers to boil their water before consuming (e.g., washing hands/face, brushing teeth, drinking, etc). Children, seniors and persons with weakened immune systems are particularly vulnerable to harmful bacteria, and all customers should follow these directions, according to the City of Houston Public Works News Release on March 4th at 10:47 p.m. Residents are advised to boil water for at least 2 minutes before drinking, cooking, and ice making or use/buy bottled water. Houston Public Works ask you to share this water advisory with the public and to affected people in apartments, nursing homes, schools and businesses by email or handout notices. For more information, contact 311 or Public Works communications at 832-395-2455. Aviso público sobre el agua potable. Para obtener ayuda en español, llame al 311. Thông báo công khai về nước uống. Để được trợ giúp bằng tiếng Việt, vui lòng goi 311. Avis public concernant l’eau potable. Pour obtenir une assistance en français, veuillez appeler le 311. This entry was posted in Asian Community Houston, Community Alert, Harris County News, Health News, Houston News and tagged Boil Water Advisory Cancelled for North Houston, Boil Water Advisory for North Houston. Bookmark the permalink.